Fifteen Twenty-One Second Avenue is a 440 ft (134 m) tall skyscraper in Seattle, Washington. Designed by Weber + Thompson, it is a residential building with 38 stories, and 143 individual homes. The building is located near the historic Pike Place Market. Construction was completed in late 2008. The Fourth and Blanchard Building, also known as the Sedgwick James Building or the Darth Vader building, is a skyscraper located in the Belltown neighborhood just north of downtown Seattle. The high-rise style construction rises to 105 meters (344 feet) and has 25 floors above the ground. Chester L. Lindsey Architects, notable as the architects of the Columbia Center, designed the building.. The building was completed in 1979 and is clad in reflective glass. 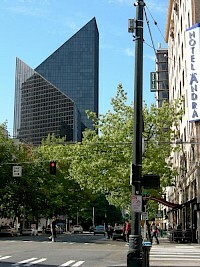 The Fourth and Madison Building (formerly the IDX Tower) is a 40-story skyscraper in downtown Seattle, Washington. The building is located at 925 Fourth Avenue, at the intersection with Madison Street. 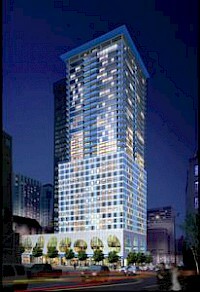 Upon its completion in 2002, the late-modernist style highrise was Seattle's first building to exceed 500 feet (152 m) in over a decade. In 2007, Fourth and Madison was awarded the B.O.M.A. International Office Building of the Year Award in the 500,000 to 1,000,000 square feet category. 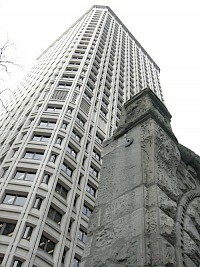 The Henry M. Jackson Federal Building is a 37-story United States Federal Government skyscraper in downtown Seattle, Washington. Located on the block bounded by Marion and Madison Streets and 1st and 2nd Avenues, it was completed in 1974 and won the AIA Honor Award in 1976. It received its current name after the death of U.S. Senator Henry M. Jackson in 1983. The Olive 8 is a 455 ft (139 m) 39 floor skyscraper in Seattle, Washington. It has 229 residential condominium homes above a Hyatt Hotel. 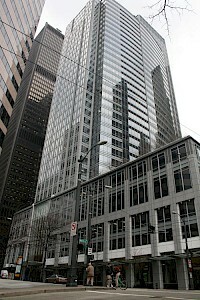 It is located at 8th Avenue and Olive Street in Downtown Seattle and is Seattle's largest residential building. The hotel opened January 5, 2009 and the first homeowners were scheduled to close on their homes late February 2009. The building has one of the largest green roofs in downtown Seattle, 8,355 square feet (776.2 m). Puget Sound Plaza is a 21-story skyscraper in the Metropolitan Tract of Seattle, Washington. The building is located on 1325 Fourth Avenue. It contains a parking garage with 334 parking stalls. The building has 271,000 rentable square feet. The lower two stories were remodeled in 1988. Qwest Plaza is a 498 ft (151 m) tall skyscraper in Seattle, Washington. It was completed is 1976 and has 33 floors. 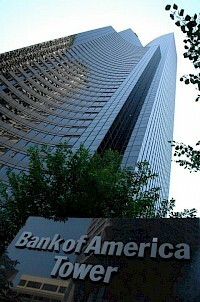 It is the 13th tallest building in Seattle, and was designed by John Graham and Associates. It was originally known as the Pacific Northwest Bell Building, and has also been called 1600 Bell Plaza, and US West Communications. 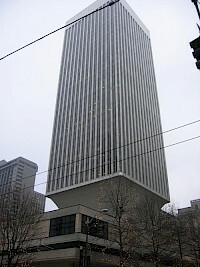 Rainier Tower is a 40-story skyscraper (29 stories occupied, the rest pedestal) in the Metropolitan Tract of Seattle, Washington at 1301 Fifth Avenue. The total height of the tower is 514 feet (393 feet without the 121 foot base). It was designed by Minoru Yamasaki, who also was architect of the World Trade Center in New York City (as well as of the IBM Building, which is on the corner diagonally opposite from Rainier Tower). Its construction was completed in 1977.